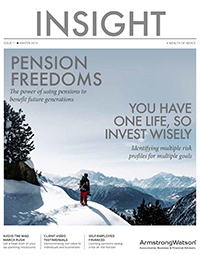 Welcome to the Winter 2019 issue of Insight. In this new year edition, the beginning of the year is the optimum time when you may be thinking about resolutions. Although the current tax year does not end until 5 April 2019, tax planning really shouldn’t be left last minute. Get a head start on your tax planning resolutions to enhance not only your own, but your family’s or your company’s tax-efficient plans in the future.